According to my new study, twice as many people have trouble with their iPod and iTunes 9 as with their toilet. 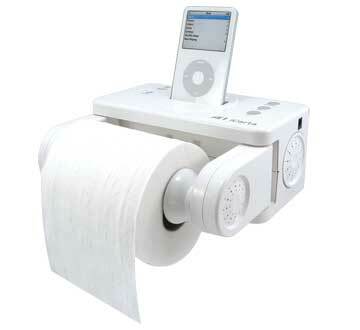 Which says something about iPods and toilets, but sometimes I just inform. I'll let you make the call on that one. This isn't a review, just some observations on this nice for the price little device. (Wasn't that a 'They Might Be Giants' lyric? For those of you googling a bit about it, I did not see mentioned that the USB port on the iPod connector is passthrough for sync and charge, and works with a standard mini USB cable. This means with the myvu glasses connected to your iPhone, and a standard USB to mini USB cable, you can sync and charge your iPhone or other device that uses the iPod connector. I sort of guard my iPhone cable, I'd rather lose a mini USB that you can get anywhere for a thruppence. Of course, the PMV-1003i does not work with the iPhone for viewing videos. Less cables to carry. This means you can also supply power to your iPod and the myvu with almost any sort of device or battery pack. Handy, as the myvu is powered by the iPod, and the iPod battery gets used a lot quicker from playing video anyway. Some complain about the contrast and brightness. On mine, the left eye's LCD display is more washed out than the right. To help contrast and brightness, you could cover the front of the glasses with a cut to fit piece of low tack tape. It's a feature supposed to let you sort of see through the glasses at the same time but it washes out the display a bit. They are so thin, you can just look over the top or under the bottom if you need to. I picked up a nearly unused one for $45 and for that price it's a nice piece of tech to have. If only it didn't work just with the iPod 5th generation...but then again I couldn't have picked it up for $45. Oh, you Star Wars Nuts! Pretty funny: A TaunTaun sleeping bag. For the half-frozen young Jedi in training at your house.